Another anecdote from the biography of White House hopeful Ben Carson is being thrown into the spotlight -- this time from his days at Yale University. A recent Wall Street Journal report examined one incident, described in the GOP candidate's widely read memoir "Gifted Hands," where a young Carson took a final exam for a college psychology class, named in the book as "Perceptions 301." Carson wrote that he and his classmates had been told their final exam papers for the course had "inadvertently burned" and that they would need to take the test again. In his book, the GOP candidate described the new test as "incredibly difficult, if not impossible." His classmates -- about 150 of them -- eventually gave up on the exam and left the room, Carson wrote, and he remained the sole student to finish it. Carson later learned that it was a test of the "most honest" student conducted by his Yale professor, and he was the only one to pass. Carson said that, at the end of the test, his teacher gave him $10 as a reward and a Yale Daily News photographer took his picture. But the Wall Street Journal reported that no photograph of Carson as a student ever appeared in the newspaper's archives. And a Yale librarian told the newspaper that no psychology course by the name of "Perceptions 301" was ever offered while Carson was a student. When asked to respond to the questions raised by the report, Carson campaign spokesman Doug Watts told CBS News: "I don't see anything to respond to. So Dr. Carson got the title of the class wrong?" The story comes just a day after a Politico article questioned the veracity of Carson's oft-repeated claim that he had been offered a "full scholarship" to the U.S. Military Academy at West Point. West Point does not offer scholarships -- the cost of attendance is free -- and Carson's campaign later confirmed that the GOP contender never applied to the academy. Because Carson's ROTC commander reportedly told him he could get into the school with his academic record, he had interpreted that as an offer. Carson later told CBS News' Nancy Cordes that the controversy over a West Point scholarship was merely a "matter of semantics." The Republican hopeful has also faced increasing scrutiny over assertions that he once had a violent past. Earlier this week, CNN ran a story investigating several episodes recounted in "Gifted Hands" -- including Carson's attempted stabbing of a friend -- and concluded that none of them could be verified. Carson's personal biography -- overcoming impossible odds as a child growing up in an impoverished, single-parent household to reach international prominence as a pediatric neurosurgeon -- has been a key part of his presidential campaign. The candidate's faith in God through all his trials has further endeared him to voters across the country, particularly evangelical Christians. But even with the onslaught of media questions, Carson doesn't envision the latest investigations negatively affecting his White House bid in the long run. 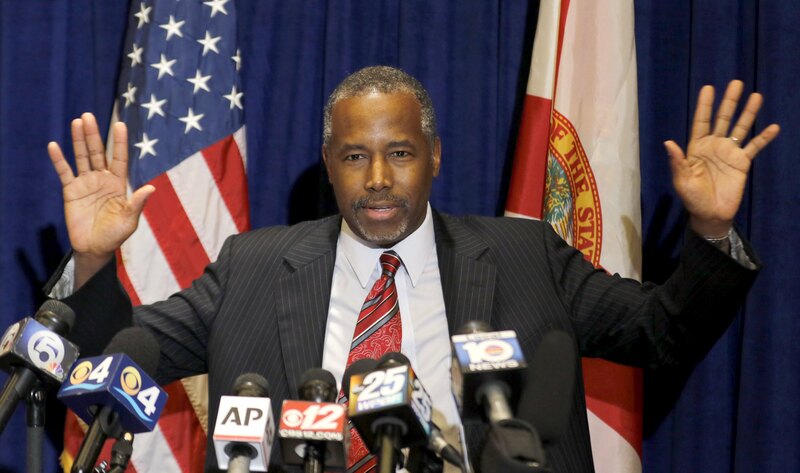 Speaking with reporters during a testy press conference in Florida late Friday, Carson said he did not believe the investigations are "causing a complication" in his campaign. "My prediction is all these things you are trying to pile on me is actually going to help me," he said.